I love me a moist, tender, easy quick bread! Using up overripe bananas…BONUS! 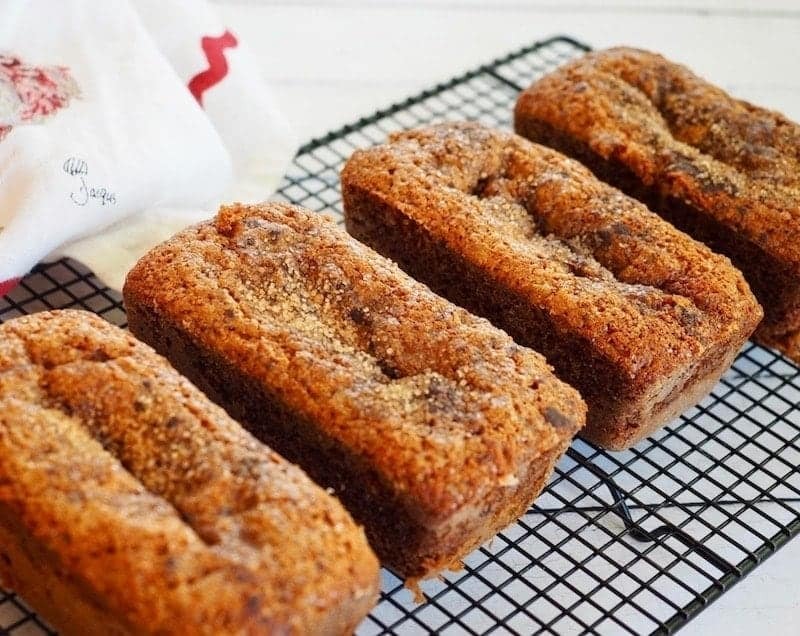 This Moist Banana Graham Oat Bread is loaded with the nutty heartiness of oat and graham flours, reduced sugar and used honey; making it the perfect afterschool snack. I know you and your family will love it! A few weeks back my oldest son had his wisdom teeth out, I was trying to think of soft foods I could make for him, other than the usual milkshakes, pudding and mashed potatoes (which he hates). I spied my very spotted bananas on the counter and this recipe was born. 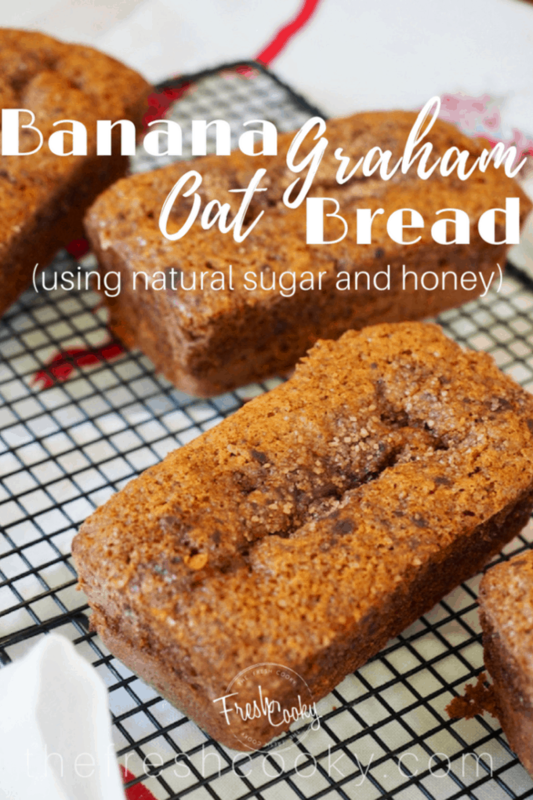 I’ve adapted it from one of my regular banana breads to be a smidge healthier using oat and graham flours in order to get a little fiber in him. One loaf yields 4 mini loaves; making it a simple neighbor, hostess or friend gift. Bakes faster, with less of a chance of the middle sinking. 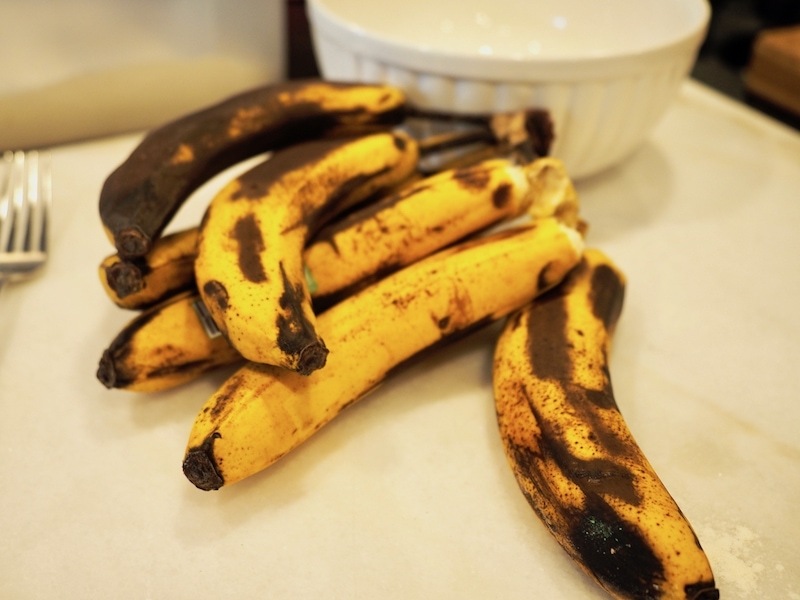 I feel like I’m constantly tossing or freezing bananas that have browned too quickly, either we go through them lickidy split, or they hang around and suddenly you have mushy, brown bananas (though super sweet) and maybe a few fruit flies. Can you relate? Ever wonder why there is the plastic wrapped around the stem on the bunch of bananas, it slows down the browning process! So if yours didn’t come with that, wrap the produce bag around the stem or individually wrap the stems in plastic wrap. Or read this article, it has some great tips for how to keep them from browning too quickly. If however; they have gone beyond the point of enjoyment; simply peel, wrap the banana in plastic wrap and place in a freezer baggie and freeze until ready to use. Thaw on counter until soft and mash for recipe. They will be brown and a lot of liquid will have come out of them, just mash it all together! 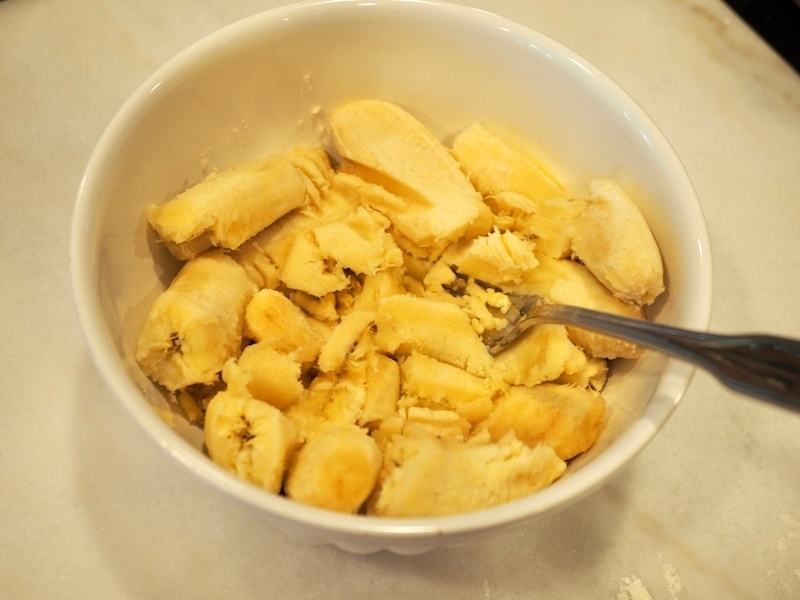 Place your soft (overripe) bananas in a bowl and using a fork mash until soft and chunky, doesn’t need to be real smooth. Preheat your oven to 350° (325° for dark non-stick style pans) and spray your pans with non-stick spray or oil (I like this Avocado spray oil, works great in all situations, high or low heat). 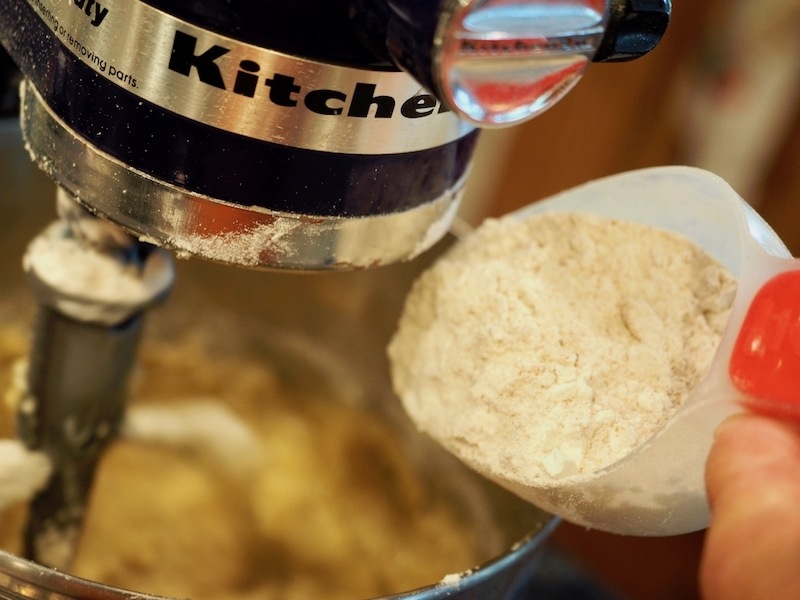 In a medium mixing bowl, measure your oat flour, unbleached flour and graham flour and mix together using a whisk along with baking soda and salt. 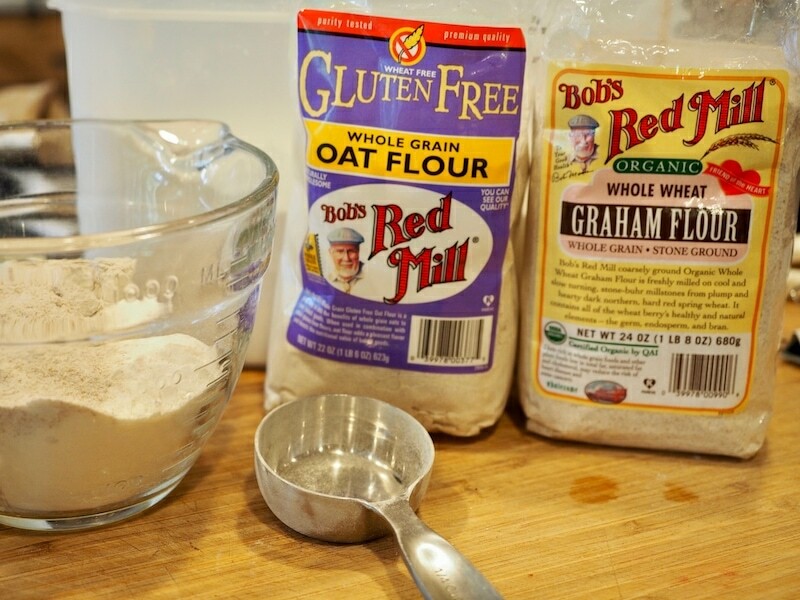 TIP | If you cannot find Graham flour, you may substitute a light Whole Wheat flour such as Bob’s Red Mill Whole Wheat Pastry Flour or just increase your all-purpose flour by 1/4 cup. 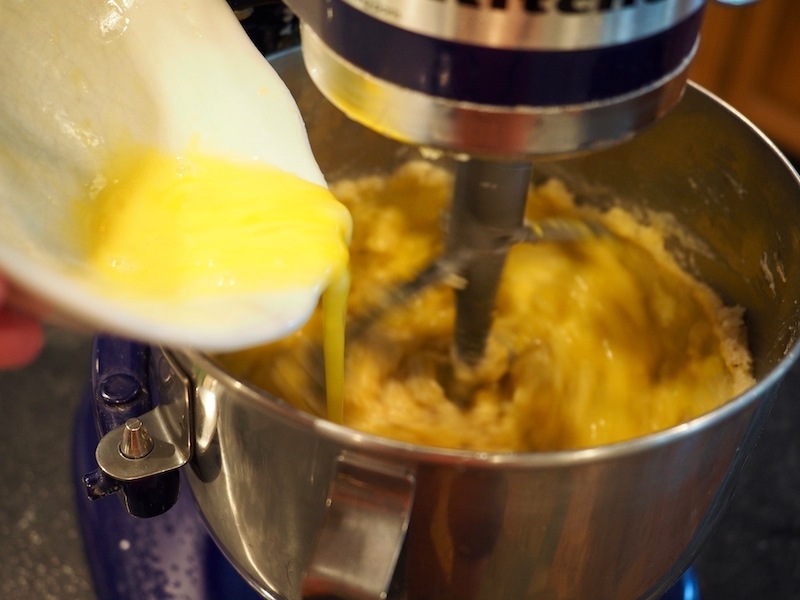 In the bowl of a stand (or handheld) mixer fitted with the paddle attachment, cream your butter on medium-high speed for 1 minute, until light and creamy. Scrape sides if needed. 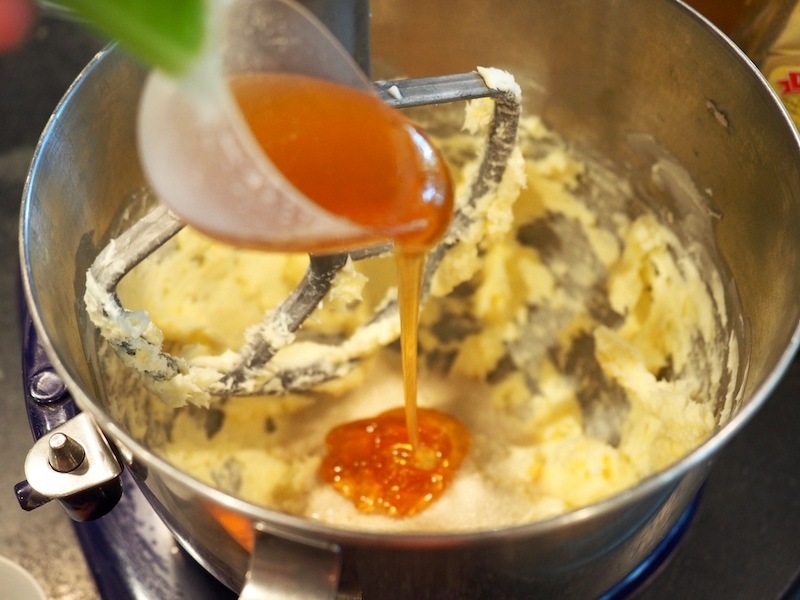 Add your all-natural cane sugar and your honey, cream again until sugar and honey are combined well with butter and mix for 1-2 minutes on medium. Lightly beat your eggs in a small bowl and add to butter mixture. With mixer on low add in your mashed bananas along with the eggs and mix until combined, about a minute, scrape sides of bowl to release any butter if needed. With mixer on low, slowly pour in the flour mixture and mix only until combined. If using nuts and/or raisins, mix in now. 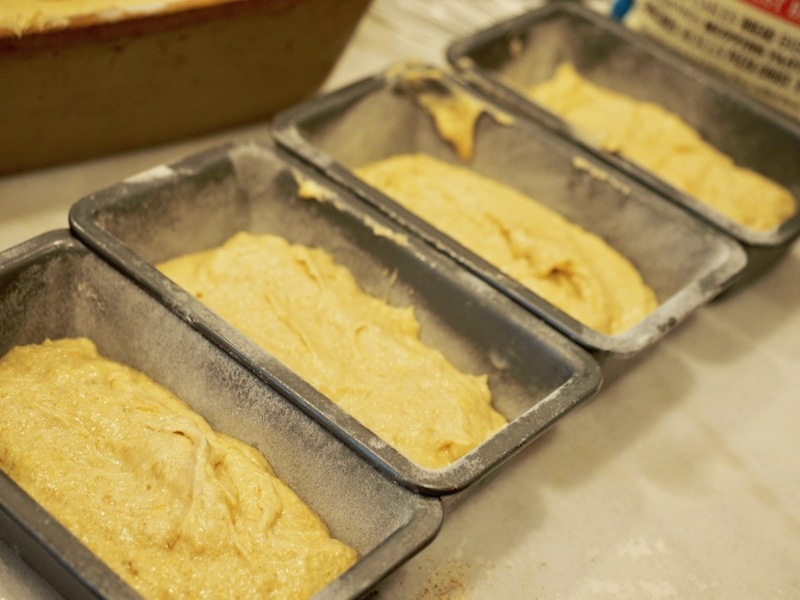 Pour evenly into prepared mini loaf pans. If desired sprinkle with a little demerara sugar or other course sugar and some cinnamon. Place pans on cookie sheet, leaving space between each pan and bake at 350 for 25-30 minutes until toothpick inserted comes out clean. Remove from oven and allow to cool for 10 minutes before transferring to wire rack to cool completely. To give as a gift, wrap in plastic wrap (cooled), then again in natural parchment paper and tie with bakers twine. Check out this post for Zucchini Lemon Bread for step-by-step instructions on wrapping. 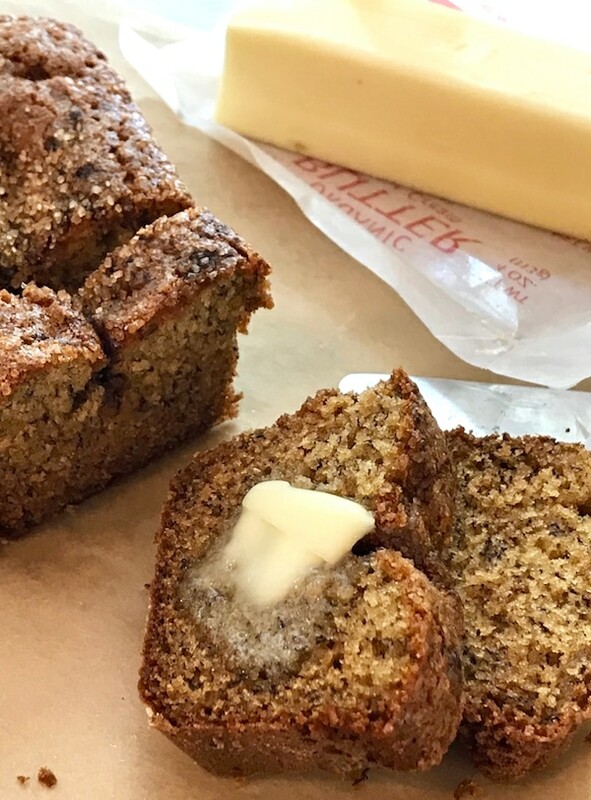 We enjoy our banana bread toasted with a little pat of butter, or make a small sandwich and slather a little butter in between. 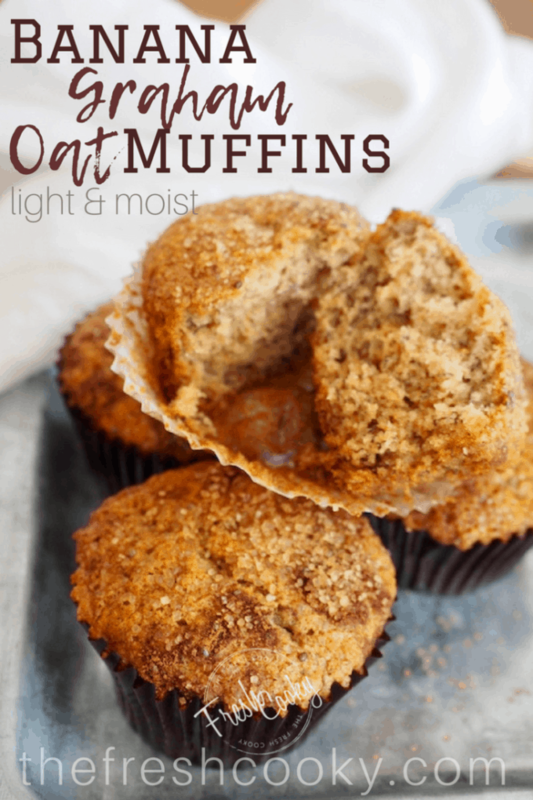 This recipe is easily adapted for muffins, they will come out a little lighter and more cake like. If you think batter is too thick, add 1 tablespoon of cream (buttermilk or milk may substituted) and mix until combined. Using a large scoop into prepared muffin tins (lined and sprayed with non-stick or oil spray) fill about 2/3 full, makes about 18-20 muffins. Bake at 350° for 18-20 minutes until toothpick inserted in middle comes out clean. Place pan on wire cooling rack for 5 minutes before removing to cool completely. PIN now for MUFFINS later! 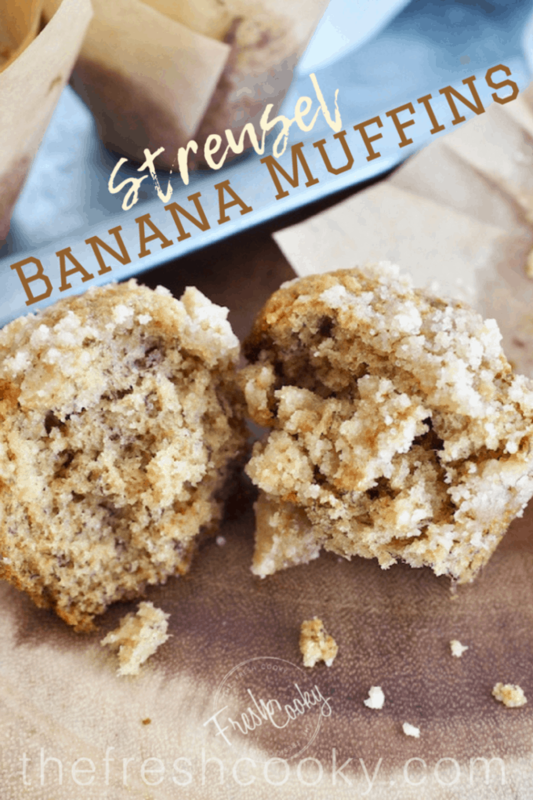 Jump on over to my recipe for Banana Graham Streusel Muffins for an even more amazing take on this simple quick bread. Oh and you just might L.O.V.E. 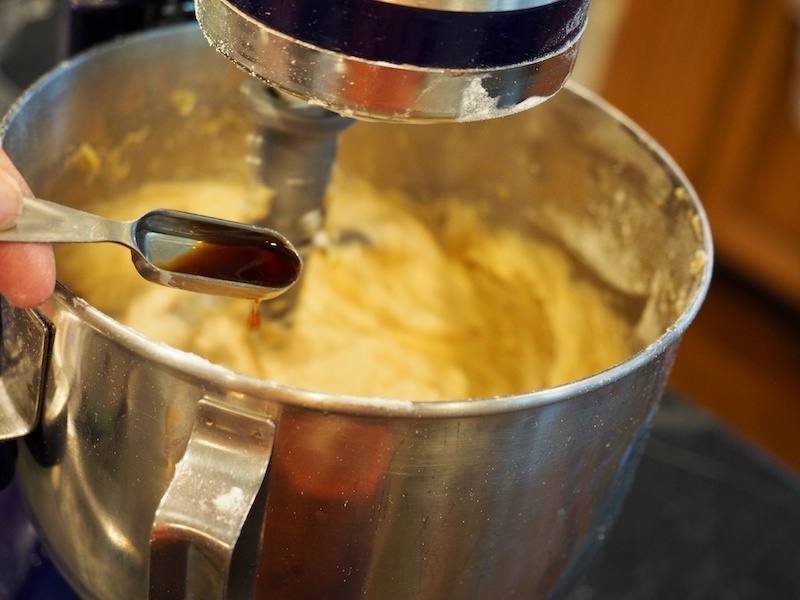 this versatile Brown Sugar Cream Cheese Frosting! Delicious on these banana muffins, carrot cupcakes, pumpkin bread, cinnamon rolls and more! 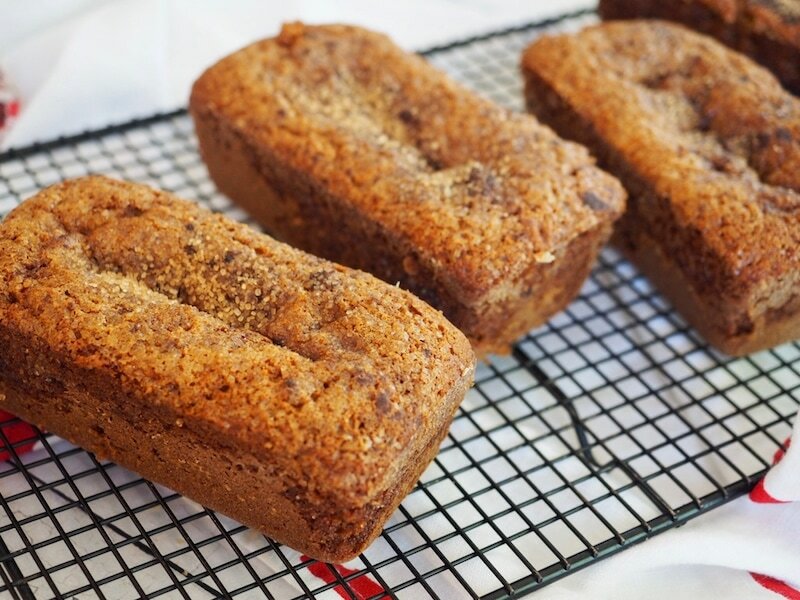 A banana bread recipe with healthy flours, ripe bananas that is moist and flavorful. 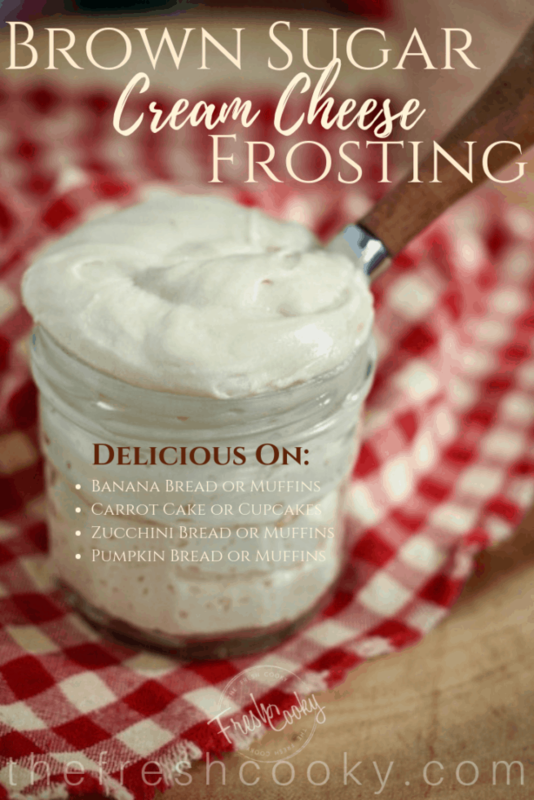 It will become a favorite way to use up overripe bananas in your home! Preheat your oven to 350° (325° for dark non-stick style pans) and spray your pans with non-stick spray or oil. Add your cane sugar and your honey; cream again until sugar and honey are combined well with butter and mix for 1-2 minutes on medium. Lightly beat your eggs in a small bowl and add to butter mixture. With mixer on low add in your mashed bananas along with the eggs and mix until combined, about a minute, scrape sides of bowl to release any butter if needed. About 1 minute. With mixer on low, slowly pour in the flour mixture and mix only until combined. If using nuts and/or raisins, mix in now. Scrape sides. 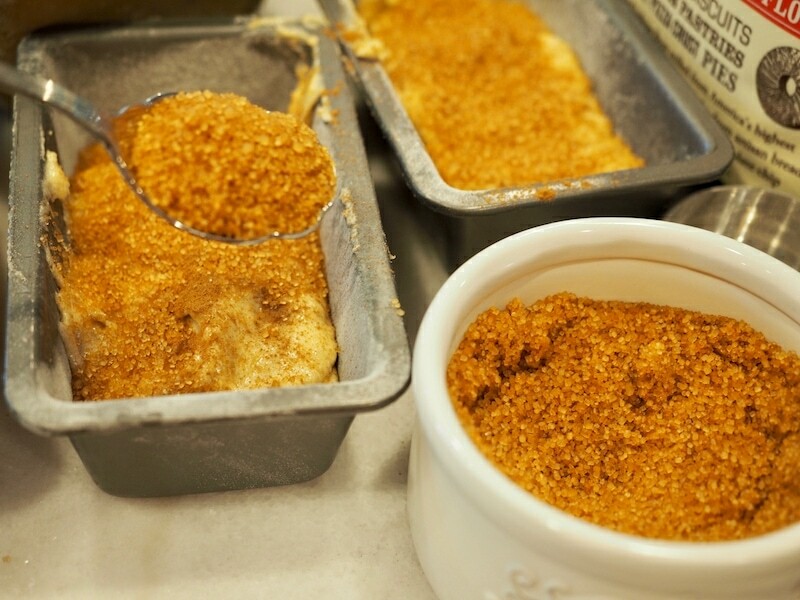 Pour into prepared pans, if desired sprinkle with a little demerara sugar and a little cinnamon. Remove from oven and allow to cool for 10 minutes before transferring to cooling rack, cool completely. To give as a gift, wrap in plastic wrap (cooled), then again in natural parchment paper and tie with bakers twine. Check out this post for Zucchini Lemon Bread for wrapping step-by-step. This recipe may be baked in a regular sized loaf pan, increase baking time to 55-60 minutes until toothpick inserted comes out clean. Using a large scoop into prepared (lined and sprayed with non-stick or oil spray) fill about 2/3 full, makes about 18-20 muffins. Bake at 350° for 18-20 minutes until toothpick inserted in middle comes out clean. Cool on wire rack for 5 minutes before removing to cool completely. TIPS | Ever wonder why there is the plastic wrapped around the stem on the bunch of bananas, it slows down the browning process! So if yours didn’t come with that, wrap the produce bag around the stem or individually wrap the stems in plastic wrap. If however; they have gone beyond the point of enjoyment; simply peel, wrap the banana in plastic wrap and place in a freezer baggie and freeze until ready to use. Thaw on counter until soft and mash for recipe. They will be brown and a lot of liquid will have come out of them. Mash it all up! TIP | If you cannot find Graham Flour, a light whole wheat, whole wheat pastry flour or all-purpose flour may be substituted. © 2018 | This recipe for Banana Graham Oat Bread was featured first on The Fresh Cooky.